At a very young age I was introduced to clay as an art medium. I still have some of the first pieces of clay art that I did with my mother as the ceramics teacher. I audited a wheel throwing pottery class at the University of Wisconsin, where my love of clay really took hold. After graduating with a Bachelor’s Degree in Psychology, I moved to Philadelphia and joined Mercy Corps where I worked as a volunteer in a social work setting. I took pottery classes and spent time in local studios practicing and experimenting with clay. After five years of social work in Philadelphia, I went back to school to get a Master’s Degree in Art Education with a focus on ceramics. 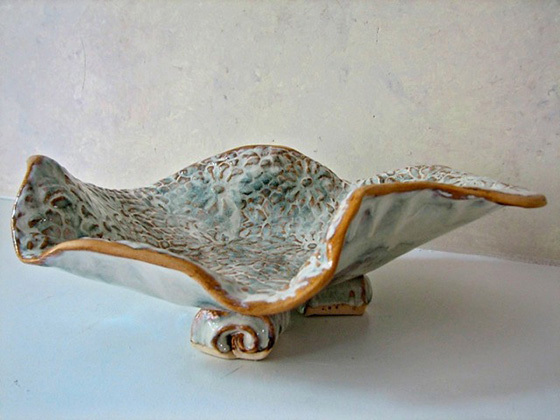 I apprenticed for two local clay artists in Philadelphia and also worked as a graduate assistant at the university’s ceramics department under accomplished clay artist, Paula Winokaur. I had unique and wonderful learning experiences working as a student teacher in Pennsylvania and in London, England. Once I received my Master’s Degree, I returned to Massachusetts where I taught art at an elementary school for five years, while personally developing my own artistic style with clay. I began RJ Arts after my second child was born in 2005, using the initials of my grandmother. RJ Arts has grown in direct correlation with the growth of my children. It has been a wonderful and fulfilling journey. I am looking forward to continued fulfillment with the creative process that clay brings on a daily basis.